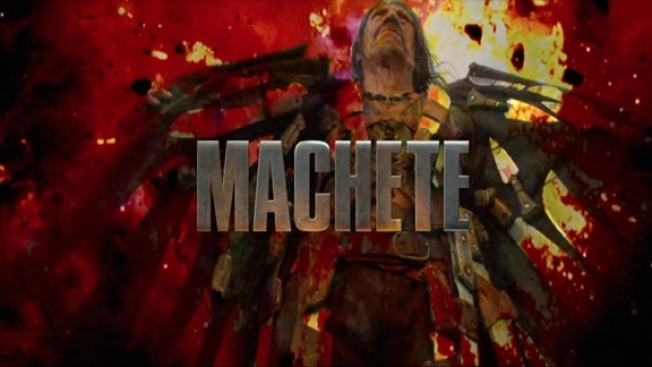 Everyone will have their favorite kills or attacks in "Machete." Danny Trejo says he loved it when he sliced off three heads with one swing of the film's title-inspiring blade. But the best attack scene in the gore-fest might be Trejo's attack with a weed whacker. It's a great moment of comedy especially since the guy he attacks is actually director Nimrod Antal in a cameo role as an Eastern European thug who picks on the wrong day laborer. "It was a blast," says Trejo, when PopcornBiz asked him about the scene. Trejo goes from guy doing the lawn-work to lethal machine and Antal's character ends up getting whacked in a way that is more humiliating than painful. "People walk into your house with so many implements of danger and I thought a the weed whacker would be the most fun," says director Robert Rodriguez. "It would be really annoying to get hit by a weed whacker." And you'd be really hard-pressed to find another action movie where this kind of attack takes place. Trejo just has fun attacking his obnoxious subject's face. Repeatedly. Ironically, Antal killed Trejo off pretty early when he directed "Predator," so this was some kind of twisted movie revenge The abuse didn't stop on camera either. Even the crew got a little sadistic with the bandage tape off-camera. "Everyone had a great time beating on Nimrod," says Rodriguez. "He was getting all taped up and the props guys were so enjoying it."